Albert Thurston was established in 1820, and has been since then providing braces and armbands to royalties, celebrities and rakish men. Albert Thurston made a solid reputation as a specialist manufacturer of braces as he received an Honourable Mention for the quality of his products during the Great Exhibition in 1851.Braces have been very popular pieces of accessories during the second half of the Nineteenth century. At that time, men of the Haute Bourgeoisie would be immaculately dressed and had the leisure to change their clothes up to 5 times during the day. The dress-code was very codified and formal. Besides shirts and braces were considered as an underwear and it would be ill-considered to show-up dressed only wearing a shirt with braces. 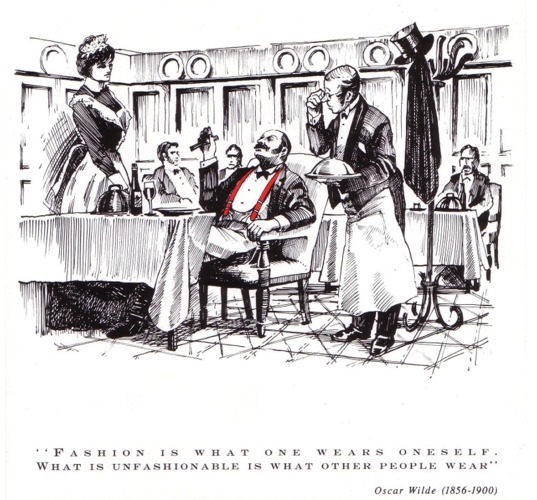 Thus, waistcoats and high-waist trousers were particularly in vogue therefore were braces as it would easily blend under a waistcoat and would feel more comfortable than a belt. The discovery of new use of rubber at the beginning f the Nineteenth century also greatly contributed to the increasing popularity of the braces that became available for cheap. 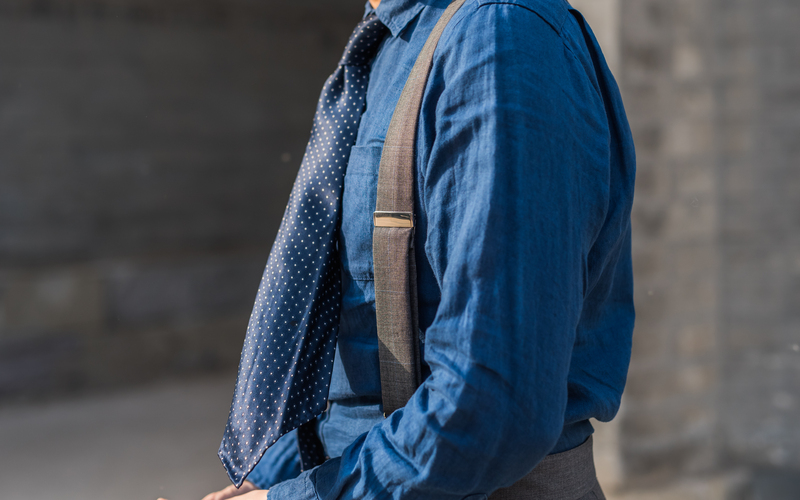 During the First World War, European have been confronted with misfortune and extreme poverty, the war left its mark on people’s mind, after the war was over styles became more casual and the waistcoat was not de rigueur anymore and belts replaced braces. Recently Hollywood movies made wearing braces popular again, first seen in the movie Wall Street in 1987. 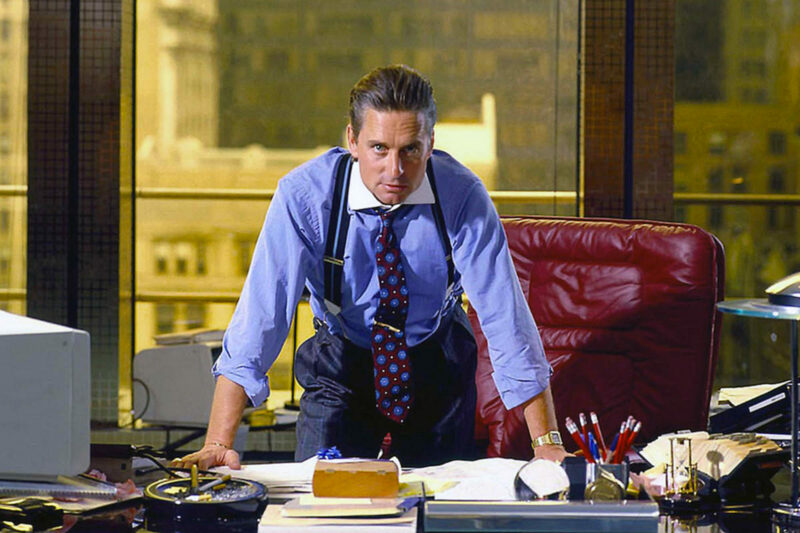 After movie released, Gordon Gekko played by Michael Douglas became the symbol of the exuberance of the Wall Street Bankers during the 80’s. Pinstripes and Chalk Stripes Double Breasted power suits, full gold watches, madder and paisley ties, white contrasting collars, and the striped Albert Thurston braces became the go-to style for anyone who wanted to show their wealth. American Psycho character of Patrick Bateman played by Christian Bale, also sported a similar style featuring Albert Thurston’s braces. Daniel Craig’s James Bond was spotted dressed in black tie with a complementing pair of White Moiré silk Braces sat at the poker’s table in the movie Casino Royal. What makes Albert Thurston’s braces so special to our eyes is first the comfort they provide, braces just feel more natural and less disturbing than a belt. After a hearty meal the belt would need to be adjusted otherwise the digestion might thus be adversely affected, with a pair of suspenders, you would not need any adjustment and your trousers would still fall naturally on your waist. James Bond wearing Albert Thurston Braces. Finally, we love Albert Thurston for the quality of the material they use, the kidskin leather used for the ends feels incredibly soft, we appreciate the wide palette of colours and designs available, eventually the softness and the quality of the fabrics, the richly-textured boxcloth will complement perfectly your suede oxfords and your flannel fish-tail back and high-waist trousers.